high rates of runoff and the presence of tropical peatlands. These carbon-rich soils are an important source of carbon to rivers, but the fate of this material remained unknown. This study investigated the relevance of rivers and estuaries in western Sarawak, Malaysia, as sources of GHGs to the atmosphere. It presents the first combined assessment of both the lateral carbon transport and carbon dioxide (CO2 ) outgassing from a tropical peat-draining river, the Maludam river. 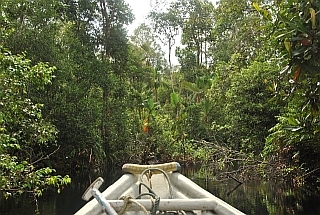 Its catchment is entirely covered by protected peat swamp forest, offering a unique setting for a baseline study. Furthermore, simultaneous measurements of dissolved CO2 , methane (CH4 ), carbon monoxide (CO) and nitrous oxide (N2 O) were performed in the estuaries of the adjacent Lupar and Saribas rivers using Fourier Transform Infrared (FTIR) spectrometry. Despite its high organic carbon concentrations, the Maludam river was actually a comparatively moderate source of CO2 to the atmosphere. Only 26 ± 15 % of the carbon was evaded to the atmosphere as CO2 , and the rest was transported downstream. Probably, the rapid transit of the water does not allow sufficient time for organic carbon to be fully remineralized, so that a large fraction is conveyed to the estuary. This could be true for most peat-draining rivers in Southeast Asia, as most peatlands are located close to the coast. In the estuaries, the residence time is prolonged, and strong tides promote oxygen supply. Therefore, aerobic respiration of organic matter is pronounced, as the observations in the Lupar and Saribas estuaries suggest. Additionally, the observed diurnal variability of CO concentrations implies that photochemistry plays a role for the breakdown of organic matter as well. In conclusion, not rivers but estuaries seem to be hotspots of aquatic CO2 emissions in western Sarawak: The Lupar and Saribas estuaries accounted for 80 % of the total aquatic CO2 emissions in their catchments.